Published on November 11, 2018 in Daily Dirt, Equipment & Products and National. Closed Tags: construction, construction industry, contractors, cordless tools, DeWALT, DEWALT 20V MAX, DeWalt cordless tools, DEWALT Inflator, infrastructure, safety, tools, trucks. I don’t know about you but one of the things I find I constantly need to do is add air to my car, truck, ATVs, utility vehicles, bike, mower, snow blower, pressure washer tires – actually anything that has pneumatic tires (that includes my dollies, wheelbarrows…). Most of the time it’s when there isn’t access to an air compressor. And on some of the current vintage cars there is no DC outlet (i.e. cigarette/cigar lighter) so the typical 12V tire inflators are worthless. 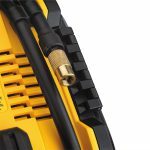 DEWALT to the rescue as it continues to expand its 20V MAX* System, now featuring over 180 products, with the 20V MAX* Corded/Cordless Inflator (DCC020I). For high pressure or high volume inflation or deflation, it features accessories and adapters for a variety of applications such as inflating tires, camping mattresses, sporting equipment, and more. The 5.5lbs. 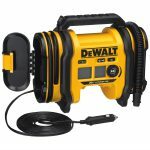 20V MAX* Corded/Cordless Inflator can be powered by a 20V MAX* or FLEXVOLT® Battery (DCB606, DCB609, or DCB612) from DEWALT, a 12V DC car outlet (12V DC cord included), or a standard 110V AC wall outlet**. Dual inflation modes allow for either high volume inflation or deflation or high-pressure inflation providing a maximum pressure of 160 PSI. Featuring a digital gauge with auto-shutoff, the 20V MAX* Corded/Cordless Inflator allows the user to pre-set the unit to the required pressure through an easy-to-use interface. 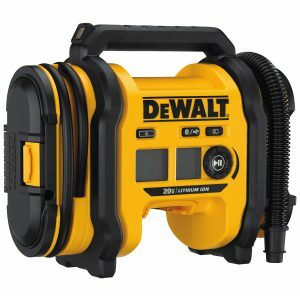 In addition, the 20V MAX* Corded/Cordless Inflator includes a threaded chuck that provides a secure connection while an LED helps to provides illumination. On-board accessory storage means that the included high-pressure nozzle, adapter, inflator needle, and a high volume tapered nozzle are easy to access. The 20V MAX* Corded/Cordless Inflator is a durable choice that also includes a high pressure-capable rubber hose and heavy-duty rubber feet. The versatile 20V MAX* Corded/Cordless Inflator (DCC020IB, bare tool only) is available where DEWALT products are sold and comes standard with a three-year limited warranty, one-year free service contract and 90-day money-back guarantee. **Battery, charger and AC adapter sold separately.